How do I clean a stormdrain? Clear the exterior of your drain only if it is safe, do not climb inside the drain. If the drain is still clogged after you’ve removed the surface debris, call our drainage problem hotline at (817) 392-3279 to report it. • Clear only drains next to the curb. Clear from curbside, not out in the street. • Watch out for traffic. Don't clear drains that are in the middle of a street. • Be careful of standing water to avoid slipping or stepping on sharp objects. • If children are helping, make sure adults are supervising. • Don't try to lift storm drain grates. They are very heavy. • Let our crews handle garbage or any hazards in the catch basin. Clear surface debris only. All proceeds from Adopt-A-Drain Fort Worth go right back to supporting the infrastructure costs associated with the program. How long does it take to install my plaque? Your custom plaque will be installed 6 weeks after we receive payment. What can my plaque say? Each plaque has a custom, 40 character message that is chosen by the adopter. We reserve the right to deny or edit any messages deemed inappropriate. How does adopting a drain keep the river clean? 80% of trash found in our waterways traveled from locations on land. 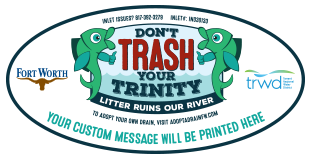 By keeping our storm drains litter free you’re ensuring that litter never makes it to the river. What if my plaque breaks? If your plaque breaks within two years of placement, we will happily replace it with a new one. If it breaks after two years you will need to purchase a new one.